Fortunately, missing teeth can be addressed with a state-of-the-art restorative dental treatment. The most common of these treatments are dentures. Dentures are a removable appliance used to replace missing teeth; they are fabricated using either acrylic or cobalt chrome to which false teeth are added. They help with speech, chewing, add support to your lips and chin, as well as improving the appearance of your smile. Dentures are kept in place by either using clasps that anchor around neighboring teeth or by the dentures’ natural suction. On occasions a denture fixative or glue is recommended to aid in keeping the denture in place. All dentures are specially designed by the dentist and dental technician to suit each patient’s individual needs. Visit your dentist first for an initial consultation. Your dentist will determine if you are an ideal candidate for the treatment and which type of denture is needed for your case. Getting dentures commonly takes 2-4 appointments. The first appointment involves getting accurate impressions of your teeth, which are then sent to the dental laboratory. The lab will fabricate a custom tray, which is used for setting a more precise mould of your teeth in wax. This mould will be used to create the final dentures. The dentures will be fitted. The comfort and fit of dentures will also be evaluated. 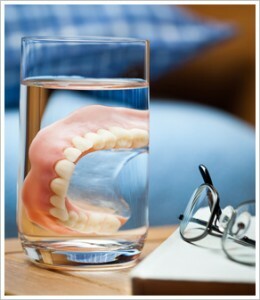 Your dentist will provide you with tips and instructions on how to properly care your new dentures. The doctors at United Smiles can help you choose the right dentures that suit your preferences. If you are looking for dentures and high-quality tooth restorations that are made from premium materials, then visit us here at United Smiles today! Our top-notch restorative dental solutions will give you confidence to smile again.